BSNL provides Nokia Siemens C2110 ADSL Modem for users who opt not to take wireless modem. It has routing feature but does not have WiFi. Since it has DHCP server, we do not need to buy an extra router to share Internet among multiple computers. However, C2110 has just one LAN port and one USB port. So you must have an additional device known as a switch to share the Internet with multiple computers. Nokia Siemens C2110 ADSL Modem is best suited for BSNL customers who want Internet on just one computer. This tutorial explains how to configure broadband on Siemens C2110 ADSL Modem and instructs how to connect a switch to share the broadband among multiple devices. Connect LAN port of C2110 to a computer using an Ethernet cable. Make sure the device is on. Type 192.168.1.1 on the address bar of your browser and press enter. When a user login window comes it will prompt you to enter a username and password. 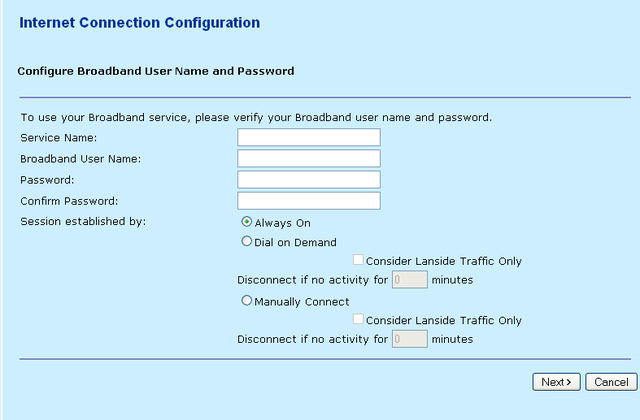 To configure the Internet in Nokia Siemens BSNL Modem, you should follow the steps below. You should delete all the default connections shown on this page. You can select the connection and click on delete symbol. After entering the details click on Next. In this page, you may need to select Obtain an IP address automatically. You should enable NAT and Default Route if you wish to connect a switch and share Internet among multiple PCs. After selecting this, click on next. Here you should enter the username and password given by BSNL. Service name should be BSNL. After entering the details click on next and on confirmation page click Apply. It is important to type the broadband service username in the right form. Do not forget to add @ part if you are given the username as an email address by ISP. If you have any doubts, you must contact technical support immediately. 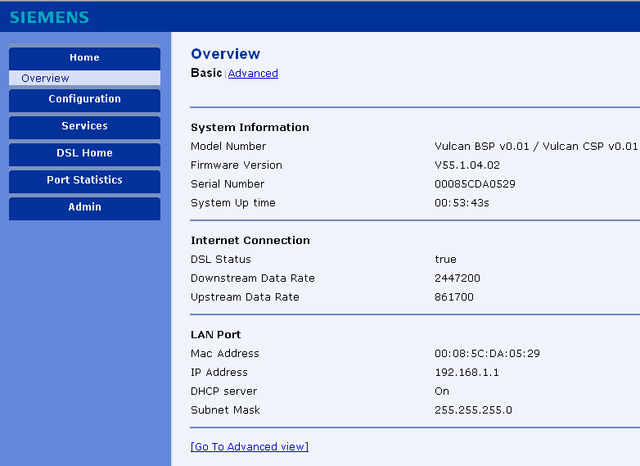 After finishing the setup you should reboot Nokia Siemens BSNL modem. To reboot, follow the steps below. Select the option Reboot from last and click on Reboot button in the bottom. It may take a few minutes to come back your modem. Can you please post some use full data on how to connect Nokia Siemens 1600 Type 2 Modem to the Laptop (OS Vista) via Ethernet cable?? You can connect the LAN port of the modem to the Ethernet port of Laptop using Ethernet cable. how to connect bsnl bb to sony bravia tv???? ?